The Mobile Application is used to input infestation, activity and Point of Interest features on a mobile device. Users can download the application and access it while out on site, including when offline, to capture the shape and attributes of features. The home page is displayed immediately after logging in. From the home page the user can access the map view by clicking the View Map button. The user can sync changes they have made, while on the map view, by clicking the Sync button. The user can download a number of basemaps, to use when offline, by clicking the Offline Basemaps button. The user can access the settings page by clicking the settings icon in the top right corner of the home page screen. The settings page provides the user with some options for altering how the system is used. About App Clicking the ‘About App’ button takes the user to a page which provides some information about the mobile application. Delete User Data Clicking the ‘Delete User Data’ will permanently delete wilding conifer mobile application data from the user’s device. Note: this will not delete the application itself. GPS Streaming interval The GPS streaming slider allows the user to specify how frequently the application will stream GPS data to the user’s device. Use UAT server? The user can switch to the UAT (user acceptance testing) environment by clicking the ‘Use UAT slider’ across to the right. 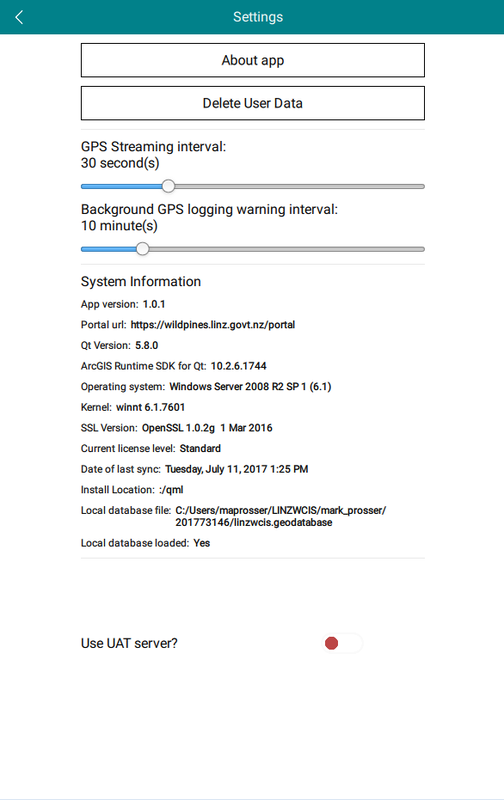 The UAT environment is used to test new functionality and train users on how to use the system. You will only be able to use the UAT environment if you have a UAT login. The map view is the main user interface of the mobile application. 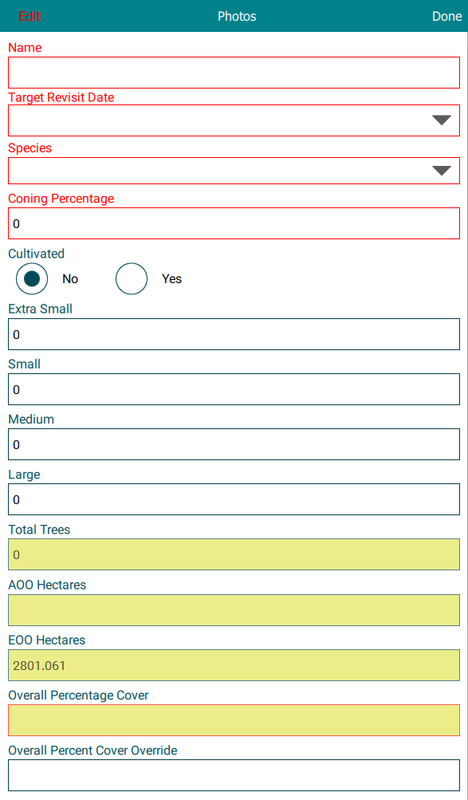 From the map view the user can view, add and edit features in the wilding conifer information system. Layers button The layers button, in the top right corner of the screen, displays the layers menu. 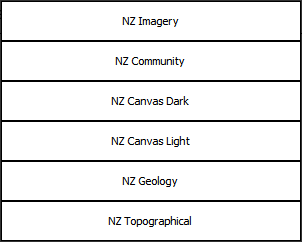 The layers menu allows the user to select which layers are visible on the map screen and in which order (i.e. background or foreground) they appear. The user can pan around the map view by first pressing their finger on the screen and then dragging the finger across the screen to move the map. The user can zoom in by pressing two fingers on the screen and either moving the fingers closer together while still touching the screen to zoom in, or, moving the fingers further apart to zoom out. The user can also zoom in using the ‘+’ and ‘-‘ icons zoom tools. 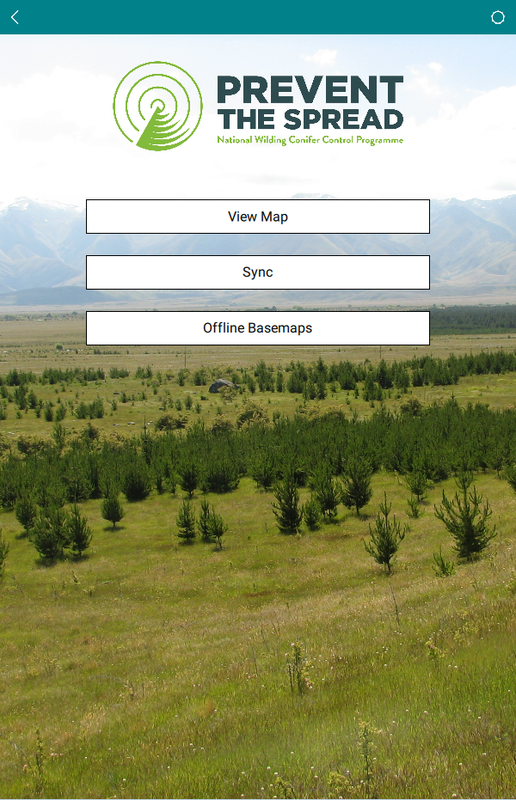 Additionally the user can return to a zoomed out view of New Zealand by clicking the ‘home’ button. A feature can be selected by pressing your finger on the screen. The selection screen will appear and provide a list of each of the features that are located at the point you selected. The Layers screen can be used to control the order of layers within the map, to change their transparency and visibility. The panel is launched by clicking the layers command on the left hand side. To change the visibility of a layer click on the layer and move the slider to a new position. To make a layer entirely invisible move the slider to the furthest left position. Moving the slider to the furthest right position will result in the layer being completely visible (i.e. 0% transparency). To change the order of layers click on the up or down arrows to the right of the layer name. Clicking on the up arrow will change the layer to a higher position meaning it will appear further in the forefront (i.e. on top of) than the layers listed below it. Conversely, clicking on the down arrow will change the layer to a lower position meaning it will appear further in the background than layers listed above it. The basemaps pop-up screen, makes it possible to change the base map that is being shown in the map view. This is useful if the map is cluttered and a simpler base map is required. 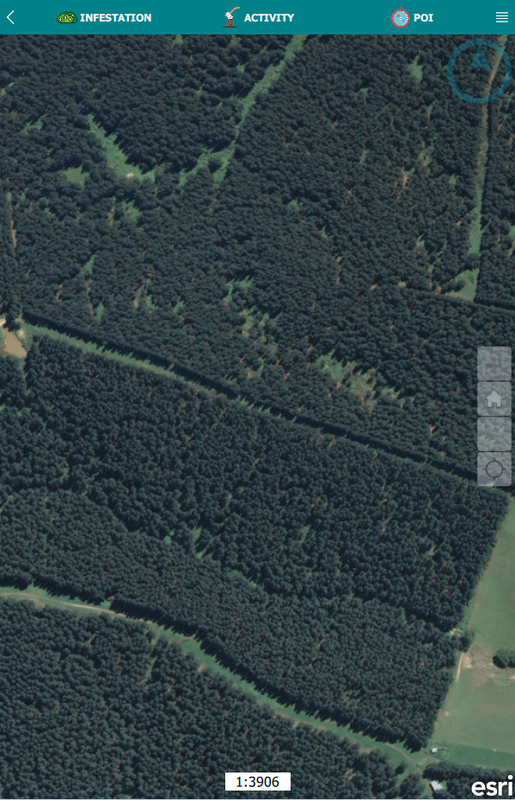 The basemaps pop-up screen provides the user with a range of basemaps to select from. Infestation The infestation button directs the user to add an infestation feature. The user will first need to digitise the shape then add the infestation attributes. Activity The activity button directs the user to add an activity feature. The user will first need to digitise the shape then add the activity attributes. Points of Interest The POI button directs the user to add a point of interest feature. The user will first need to digitise the shape then add the point of interest attributes. The undo shape button removes any vertices that have been added prompting the user to start again. The user will remain in create shape mode, which differentiates this feature from the cancel shape button. The digitising tool allows the user to add a shape by clicking on the screen to add vertices. Vertices can be moved by pressing a finger on the vertice and dragging it to a new position. 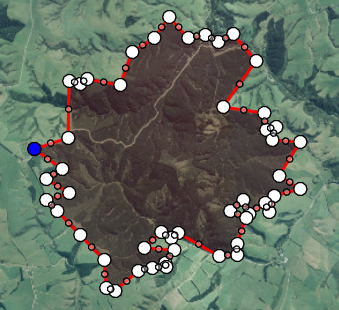 The tracking tool allows the user to automatically capture vertices by GPS as the user moves around a site. The cancel shape button allows the user to cancel the shape at any point and exit edit shape mode. 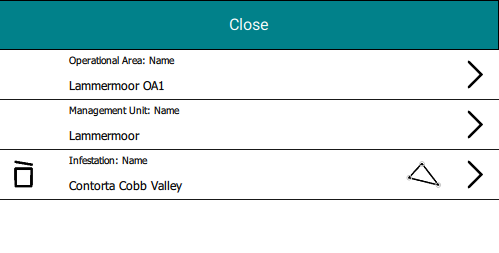 Modifying properties The properties of a feature can be modified from the selection screen by clicking on the arrow button to the right of a feature. The user will be directed to the webform for that feature. Clicking the ‘Edit’ button in the top left corner allows the user to change the attribute values. The properties webform allows the user to enter the attributes for the associated feature. 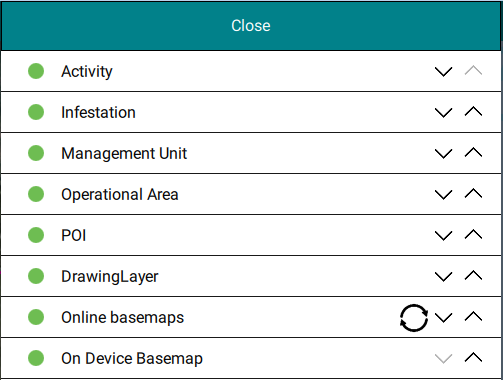 Photos can be added to the infestation and point of interest features by clicking the ‘Photos’ button on the properties screen. Click the camera icon to take a photo using your device’s camera. Click the folder button to select a photo from your device’s storage. Click the tick button to confirm the photo you have selected.